California voted on midterm elections last Tuesday, Nov. 6, and the California Public Interest Group (CALPIRG) at UC Riverside worked to remind students to vote. At 5 a.m. at the Bell Tower the student interest group set up a booth decorated with signs reminding students to vote at UCR’s polling place over at Glen Mor in Room J135. At the booth, CALPIRG gave donuts to those that already voted and would give them to others voting at Glen Mor when the team marched over at noon. More attention was gathered through the booth with Luna, a “vote goat” provided by a high school friend of Carlee Karhn, a first-year life science major and CALPIRG member. “She’s probably the most patriotic vote goat you’ll ever see; she was actually born on July 4th,” Karhn said. CALPIRG and all other Public Interest Group (PIRG) chapters throughout the United States have coordinated numerous vote-publicizing activities for college students over the past several weeks, all in an effort to raise student voter turnout through their voting awareness campaign, the “New Voters Project (NVP).” According to the CALPIRG Students website, the project aims to “cut through the clutter of voting” for students, such as by registering and educating them on what they are voting for, with the ultimate goal of making every student’s “voice heard on the issues that matter to (them).” As a whole CALPIRG aims to “combine the energy of students” with advocates and organizers in order to accomplish statewide change. At UCR, CALPIRG has helped over 1,000 students register to vote this year, in collaboration with other campus organizations. The Associated Students of the University of California Riverside (ASUCR) was one of these groups, and its president, Semi Cole, came out to the booth on Tuesday to show his support of CALPIRG’s efforts. He also assisted in CALPIRG’s goals by holding a rally the day before, further reminding students to vote before Election Day. In an email interview, Cole talked further about ASUCR’s own effort in getting students to vote. “With the Office of the President and Office of External Affairs pulling together their combined effort, ASUCR students have worked hard to inspire the student body to recognize the power of the youth vote,” Cole wrote. Performing actions in line with the goals of NVP Cole stated that “ASUCR did succeed its goals in engaging campus to become interested in the midterm election. 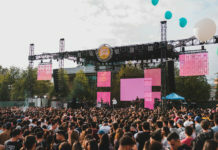 We had over 15 student orgs register for the vote crew registration competition, and over 500 UCR students registered on Vote Crew,” an online voting site that connects students with the rest of their campus to encourage voting. Isaiah Parks, a third-year biology major, was one of the voters at the precinct that Tuesday and said he recognized the campus’s recent efforts to get students to vote. “Voting was more publicized this year compared to the last time around,” Parks commented. “You saw lobbiers and posters throughout the campus, the community, the HUB; there was also the ASUCR rally (on Monday).” In a publicity effort CALPIRG at UCR chalked up the campus grounds with arrows leading to the Glen Mor polling place in the early morning that Tuesday. Elisa Chang, a fourth-year double major in psychology and education, is a campaign coordinator for NVP this year. 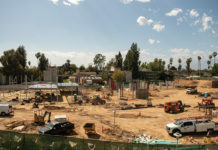 In an interview, Chang reported that UCR’s CALPIRG chapter began carrying out NVP as far back as mid-September, before the first week of fall quarter. Throughout the quarter her team “had class reps where we had students register to vote before class started,” Chang explained, “with the professors’ permission; we would take as much as 15 minutes doing this, making sure everyone filled their forms out correctly. We also did a lot of tabling around the Bell Tower and lobbying to students at the dorms: a lot of grassroots work,” she noted. 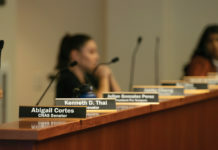 Angela Ayala, a third-year liberal studies and education major, has a class with Chang this quarter, and was present during her CALPIRG class rep. In an interview via text message, she wrote that “Both (Elisa and CALPIRG as a whole) definitely helped me get registered to vote, I was just sitting in class … (and then) Elisa had an announcement to give at the beginning of class,” Ayala wrote. She said that Chang talked about the importance of voting, and that voter registration forms were passed out by another CALPIRG member. “In doing so, it made it easily accessible to register in the comfort of my own class,” Ayala concluded. At noon the team marched throughout the campus, all the while holding up signs telling students where to vote and asking passers-by with a megaphone if they had already voted. They passed by the Coffee Bean, marched around Bourns Hall and into Bytes, exited the building and walked up the streets of Campus Drive and Big Springs Road, finishing at Glen Mor. The team then stationed themselves outside of the precinct, giving out donuts to students once they had voted and conversing with those in line. To keep voters encouraged, the CALPIRG team handed out the rest of their donuts and ordered pizza for the hungrier people, all the while commending the students for staying out so long to cast their vote. At 11:30 p.m., more ballots were delivered to Glen Mor and voting finished up past midnight, according to an email sent out to student CALPIRG supporters. “It was so inspiring to see all of those students waiting for over five hours to get their vote in,” Chang remarked. “We were all there for the same reason, and I think I learned something about in-person barriers from it — Glen Mor wasn’t prepared for all of these students, and with the presidential election in two years now I know we have to work to break down barriers like this,” Chang concluded. Cole was also glad to see the large turnout of UCR students at the polls. “(I’m) so proud that students made the time to make it to the polls and participate in the political process. It’s efforts like this that show Washington and Sacramento the power and vitality of the student voice,” Cole commented. Chang finds that the active nature of student voting at UCR this year is something that historically hasn’t been “institutionalized,” referring back to the 2014 midterm elections: “Only eight percent of students at UCR voted that year, but the average turnout across the UC systems was 20 percent, more than twice ours,” she observed.